January Sales Try-On, Featuring Hits & Misses ~ Roses and Rain Boots . I'm fortunate enough that I get to live in the same town as my mom. And even luckier that we enjoy each other's company. My momma and I frequently gather for a gals morning. Usually, this can consist of anything from shopping and manicures to exercising. This past weekend we took a trip to our "local" mall, an hour away (I mostly shop online based on our proximity to my favorite stores) and did some browsing. While shopping, we had a lot of fun scouring the stores for new style inspiration. 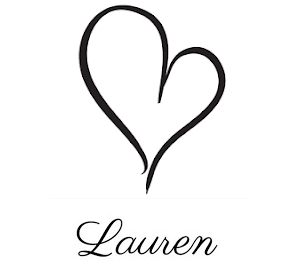 We looked for unique pieces or trends to add to our current wardrobe. While also searching for new ways that we can create new looks of our favorite pieces already in our closets. 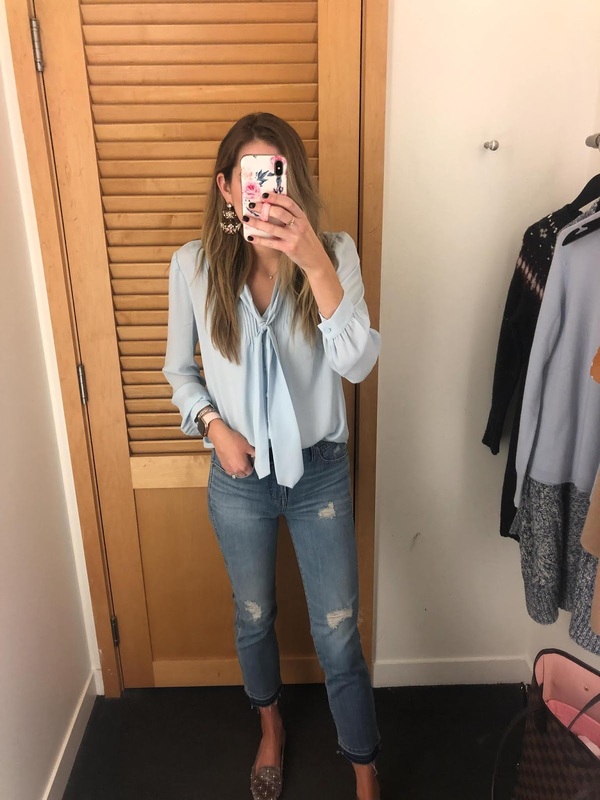 Since my Nordstrom Anniversary Sale First Impressions post was such a hit, along with my try-on mirror pics, I've decided to listen. 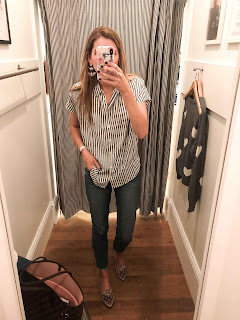 So today's post is featuring all the things that caught my eye from our recent shopping adventure that I tried on & wanted to share my thoughts with Y'all. Be sure to leave a message letting me know what you thought of this style blog post & if you're buying, what items? While out shopping I noticed the stores were also struggling with the seasonal disorder. Right now, I crave spring and all the cute clothes that come with it, but the reality is that winter has only just begun. 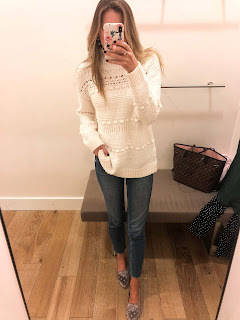 As a result, the stores seemed to be featuring a lot of "the same" items that we saw before the holidays mixed with a few new pieces that would be great for "spring" but like I said before... I don't know about you, but there's no way I'm wearing short sleeves anytime soon. It also felt like the stores were "empty." 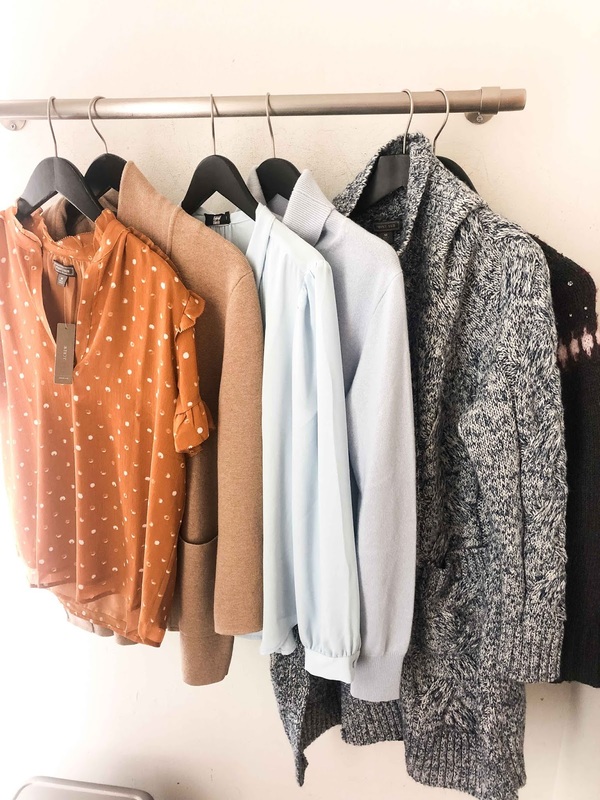 One thing to know when shopping now, look for items that you can wear now & later. Let's start with this beautiful combo from Madewell. These are by far my favorite items from the haul. For starters, as soon as I saw this sweater, I knew I needed it in my life. At first glance, I knew it would look great paired with white jeans. Then, my mom suggested layering it with the striped top in my hand. HELLO, why didn't I think of that? Of course, they look perfect together. A serious match made in heaven. 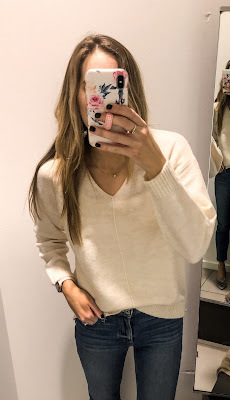 This sweater is slightly cropped in the front, with a tad longer hem in the back (basically like all the sweaters currently out right now). This style makes the sweater especially great for layering. 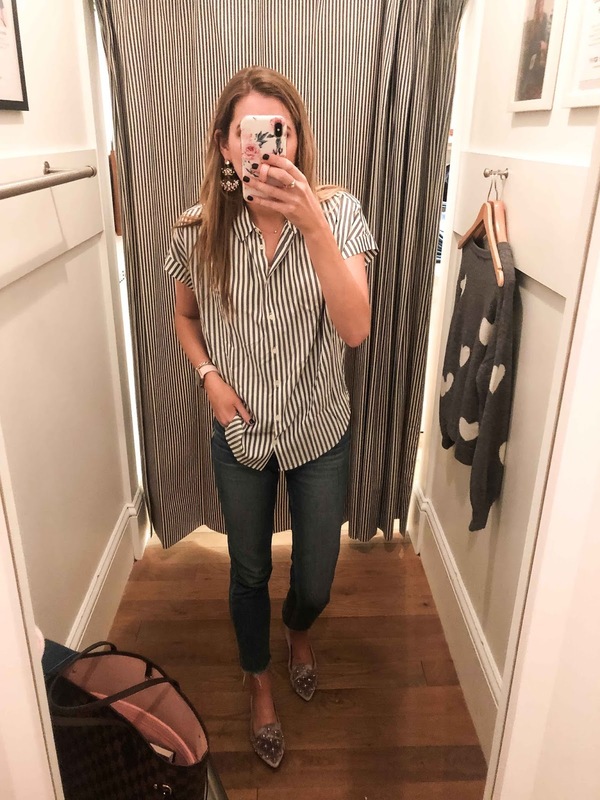 The second item purchased is the most adorable striped button down top. It’s the softest button down I own to date. It WILL be on repeat this spring and summer, so if you’re on the fence, buy the shirt now! I already see it styled with white jeans, a denim jacket, and mules as we transition to the warmer months. Followed by styling it tied in the front with a pair of high-waisted denim shorts and sandals. *Wearing size S in the sweaters, and size XS in jumpsuit* Y’all know I love a good Loft try-on. Their stuff gets me every time. I’ve been eyeing these sweaters for a long time & while on significant clearance, they offer limited sizes online. Additionally, they started to display their spring stuff & I immediately jumped on board with the polka-dot jumpsuit. I mean… it has polka-dots, pockets & is a jumpsuit. 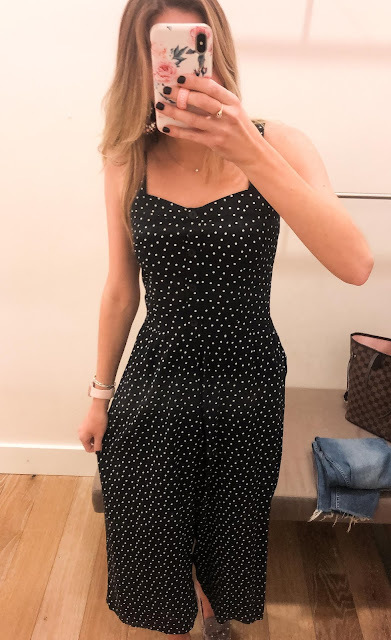 While extremely cute, I want to be your style guru, so I have to be honest and share that the jumpsuit pinched me, right by my underarms, a place I don’t particularly love about myself. This means I would only wear this style with a shirt underneath or paired with a jacket. However; the straps are thick enough that they completely cover your bra straps. If you didn’t find anything, you loved this time around… stay tuned because my local Loft store & I are in the process of planning another meet & greet styling event! If you know one thing about me, then you know I have a true love for J.Crew. 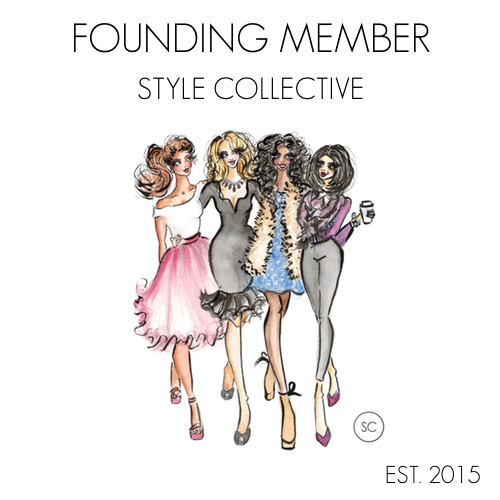 While pricy, I know their items are made to last both in quality, style, and trend. I immediately fell hard for this periwinkle tie-neck blouse; however, I’m sad to say this number did not make it into my cart because the sleeves were a tad too short for my taste (I am 5’9” for your reference). 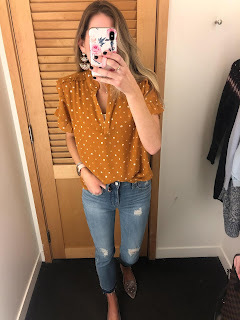 Additionally, this polka dot blouse was everything I imagined it to be & I need it in my life. They were completely sold out in my size so I will have to order it online. When a new arrival is already selling out, it’s an immediate sign that it will be a fan favorite. 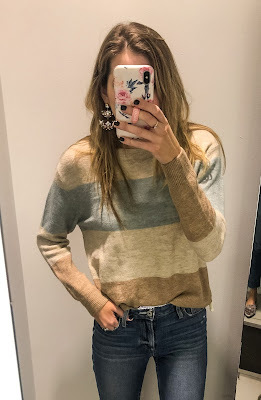 I can’t stop, won’t stop with my recent obsession with H & M. Oh my goodness, they are just killin’ it in the sweater department lately. They keep bringing out winners and this round-up consists of sweaters $24 and under! Yes, please. Give me all the cute sweaters. Let’s get started with the most perfect purple v-neck sweater. I styled this sweater off the shoulder and was immediately obsessed. It fits a little snug, so you could definitely size up. This sweater can also be styled over a button down for a more work appropriate look. Plus, it matches my favorite flats (ON SALE) perfectly. It was a match made in heaven. 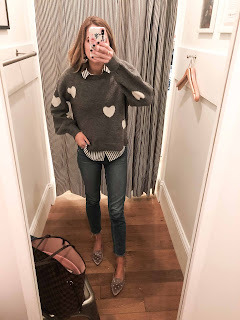 Immediately following, I tried on the cutest striped sweater, which will absolutely carry into spring. It’s a lighter-weight material so I can imagine pairing this with white capris and a denim jacket for those early spring months. Next up is this white v-neck sweater that runs a bit oversized. I’m wearing my traditional size, and I love the fit. I did try styling it with a slightly off-the-shoulder look, and it could be done, but it’s really not meant for that with the line down the middle. At only $20, this sweater is the perfect upgrade to the classic grey turtleneck sweater I’ve styled before. Plus, it comes in a variety of colors. Lastly, this long open front cardigan. SWOON. If you were to buy one thing from this haul, I could not recommend this cardigan enough. I own a similar style cardigan from Madewell and Old Navy. This option is not only cheaper than BOTH, but it's also is super soft. While cute, my Old Navy cardigan is noticeably not as soft or comparable in the quality of the material. I actually couldn’t believe how similar the H&M cardi measures up against the Madewell cardigan. Safe to say, I purchased the lighter color (I know, I know… how many cardigans does one girl need? You would be surprised). This lighter option, linked here, comes with pockets. 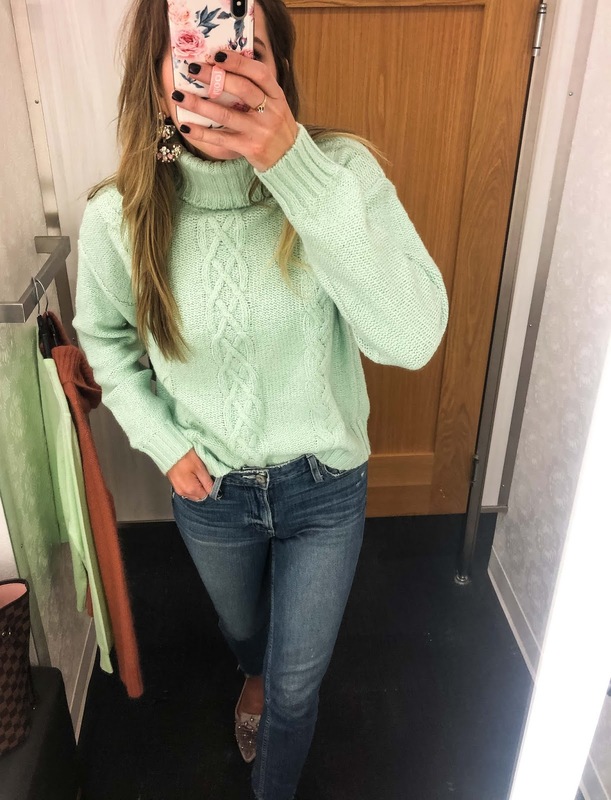 Last up is this gorgeous mint green cable knit sweater. It is so incredibly soft and warm. Definitely worth the money. This color would be perfect the way to bring a little spring into your wardrobe, while still being practical for the weather. Well, that's it for today! Hope Y'all enjoyed seeing a quick try-on featuring all the things that caught my eye in the store.